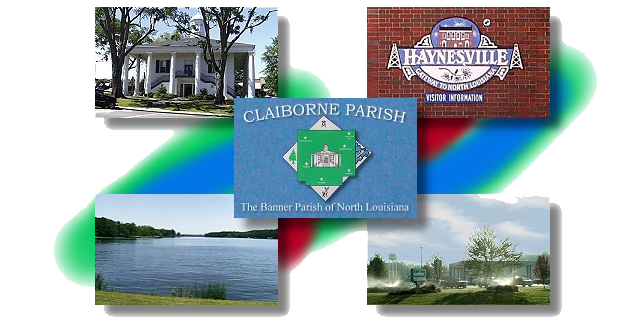 Welcome to Claiborne One – the official Home Site of The Claiborne Parish Police Jury, The Claiborne Parish Sheriff’s Office, The Town of Homer, The Town of Haynesville and all of Claiborne Parish Louisiana. With mild winters (average January 46.4° F) and summers (Average July 82.5° F) the best adjective to describe Claiborne Parish is Pleasant! Claiborne One was envisioned from the onset as a single source, Official “Parish Wide” Web Presence, for all Governmental, Community and Business Resource Entities in Claiborne Parish. A concept unlike any other Parish or Municipality (to our knowledge) – an entire Parish – Police Jury, Towns, Communities, Business Groups and Community Agencies pulling together to create a Unique Public Resource for our residents, visitors, prospective residents, displaced former residents, and prospective industry. The complete service directory originally produced by The Family First Coalition will be presented online. Information covered: Educational Programs & Resources, Health & Medical Resources, Social & Community Programs, Clubs & Organizations, Related Internet Resources and much more. Portions are now online with additions added monthly. Online News and Images of Community Events, Claiborne Parish Scenery, Lake Claiborne, Athletic Events and more. To submit your images for inclusion in the Claiborne One Image Archive you may email them to webmaster@ClaiborneOne.org.